Streamlined look with more space, power options, and tech. Detroit, MI – Hard to believe when the Ford Escape first arrived in 2001, there were only 6 other small utilities. Today, that number balloons to 22 and will hit 30 by 2022. Not a surprise as people continue swapping their cars for crossovers. 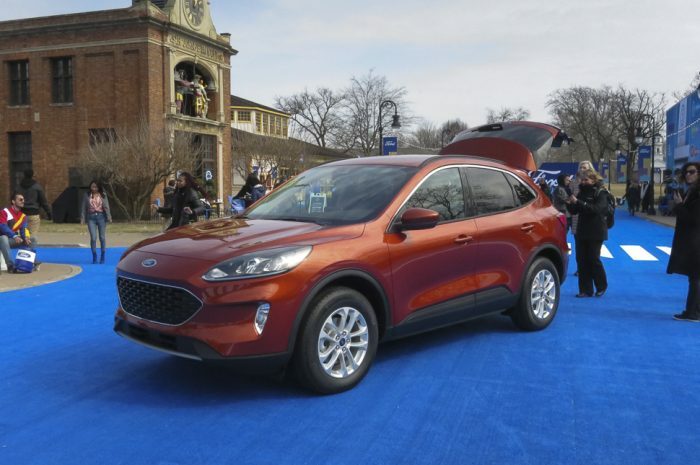 Built on a new architecture and completely redesigned, Ford put a lot of love and attention into their 4th-generation 2020 Escape. When you’re in the largest, most competitive segment with popular models like the Honda CR-V and new Toyota Rav4 nipping away, you don’t really have a choice. The company’s best-selling vehicle and the 12th best selling vehicle in the US, the new Escape looks to offer top design, overall flexibility, new technology, and uncompromising performance & capability. A small SUV hauler suited for modern utility customers’ day-to-day needs. Can Ford continue its reign? 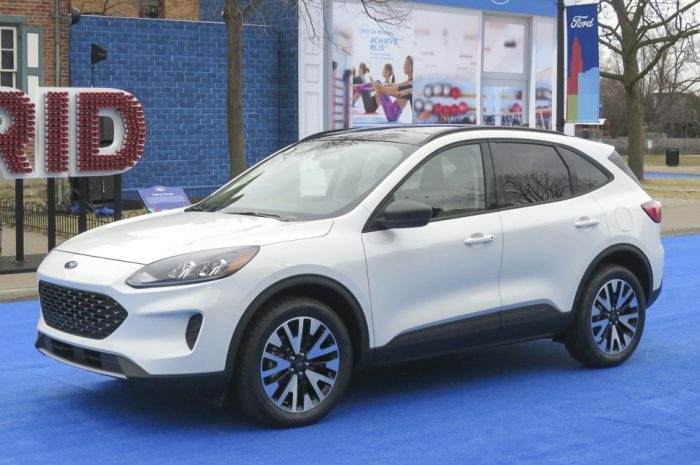 We’ll have to see when the new gas-powered 2020 Escape arrives at dealerships Fall 2019. Escape Hybrid and PHEV will hit dealerships spring 2020. Expect pricing to be higher than the outgoing model; full pricing will be announced closer to sale date. Production is out of the Louisville Assembly Plant in Kentucky. Trims are similar to the 2019 models with S, SE, SE Sport, SEL, and top-end Titanium. Note, the SE Sport is a US-only model; Escape Titanium in Canada won’t come in gas-powered versions. Remember when the Escape came in hybrid form? It was one of the first small utilities to do so back in 2005, then vanished in 2009 or so. Well, it’s back for 2020 and will be the only small crossover to offer both a hybrid and plug-in hybrid powertrain options. Available on the top-trim Escape Titanium, the improved 2.5L Atkinson cycle hybrid engine with electronic continuously variable transmission makes 198-hp while hitting a top speed of 85 mph, for front-wheel drive models. As far as figures go, Ford pins the standard hybrid to get best-in-class EPA-estimated range of more than 550 miles, while the PHEV targets a best-in-class EPA-estimated pure-electric range of 30+ miles. As we move closer towards an all-electric world, Ford’s decision to include a hybrid with an electric plugin option makes sense, offering better fuel economy. Time to charge the Escape PHEV? Available on all models except the SE Sport (US only), the Escape Plug-In Hybrid has a Level 1 / Level 2 AC charging port. Using a 110-volt Level 1 charge, the estimated time to fully charge the battery is 10 to 11 hours. Using a 240-volt Level 2 charge, charge time drops to roughly 3.5 hours. Expect the hybrid Escape to get 4 new selectable EV modes: Auto EV, EV Now, EV Later, and EV Charge. These settings toggle between gas or electric power, depending on driver needs. For Canadian shoppers, the top-end Titanium trim will only offer hybrid power. SE Sport is only available in the US, also fitted with the hybrid as standard. This matters because it takes up less space and weight which is always a good thing. Now the size of a briefcase, the battery located in the undercarriage is 3 times smaller than the original battery from the 2005 Escape Hybrid. Despite the lower roofline for 2020, the new Escape boasts more cabin space than before. This includes increased shoulder, hip, and headroom both front and back. Ford moved the fuel tank back offering wider door entry points (improved ingress, egress). Paired to a 20mm bump in wheel base, the inside just feels expansive compared to the outgoing model. Gas-powered Escapes now get a sliding 2nd-row offering improved rear passenger space, discussed below; when in forward position, the rear cargo area extends roughly 6-inches to offer 37.5 cubic feet of cargo space. Automakers love saying they’ve got ‘lots of room!’ but we wanted to make sure. So a couple 6-ft-plus journalists sat in the 2nd-row and indeed there was plenty of legroom back there. With 3.5-inches added, the new Escape will offer best-in-class legroom across the board to include increased knee clearance and footwell length. Fun fact: Ford claims the new Escape offers more space than the massive Chevy Suburban in the 2nd row. Crazy. Another fun fact: You can fit 4 golf bags and 4 passengers comfortably in the 2020 Escape. Right on. Adequate cargo is a deal breaker in smaller utility vehicles. Ford ensured they stepped it up for this redesign. 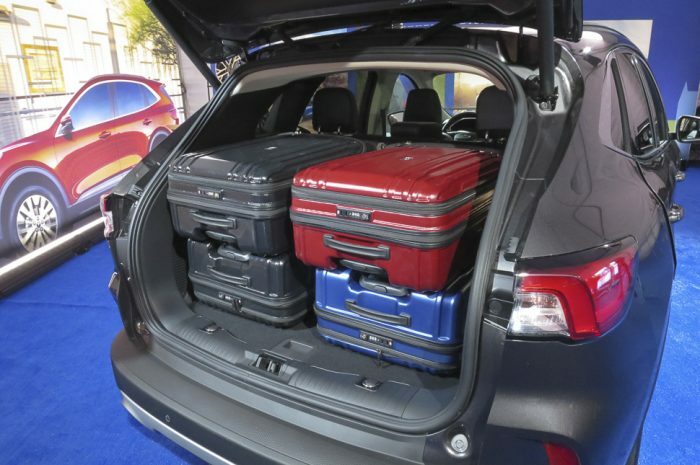 Aside from the 4 golf bags, the Escape rear can also fit 4 large suitcases (yes, not small carry-ons), and dog-lovers with large pups will appreciate the 36-inch dog crate capability. The newly added electronic gear shifter now opens up the space in the front cabin; and the glove box is bigger too, which is big deal for some people, for some reason. 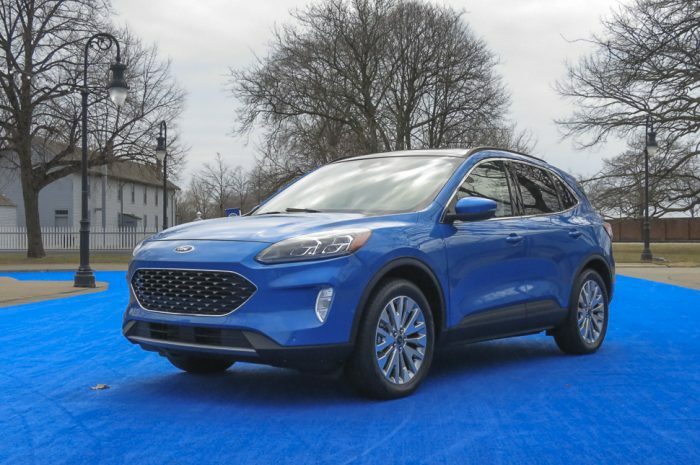 When the covers came off the 2020 Escape and examining the new proportions and design cues, this little hauler looked very similar to a Porsche Macan – the front headlight treatment and rear design profile paired to the overall sleek lines. I mentioned this to Ford following the presentation and they didn’t seem to mind the compliment. While the looks inline with a luxury German rocket may be a bit subject, the 2020 Escape does floss a more upscale feel compared to the outgoing version. For instance, the ESCAPE logo on the rear hatch is separate, spaced-out letters often found on more premium vehicles. Extending the horizontal taillights to the tailgate is a nice touch, too. In good company, the new Escape can draw inspiration from some worthy siblings. The shield-shaped trapezoidal grille is inspired by the sixth-generation Mustang, while the lower front end borrows from Ford GT. Compared to the current model, the all-new Escape stands lower, wider and longer. These days, a vehicle redesign often entails dropping weight. The Escape is no exception, shedding over 200 pounds mainly by employing copious amounts of high-strength, lightweight steel. Again, this small utility looks sleeker and sportier than ever. In turn, more aerodynamic for 2020 with its sloped roofline, optimized liftgate spoiler and strake, and efficient underbody. Compared to the last 3rd-generation Escape, Ford managed to improve overall visibility as well. Technically, these 2020 Escapes you see here are prototypes; obviously, we didn’t get to drive them, yet, so no drive impressions until we get behind the wheel late this summer. 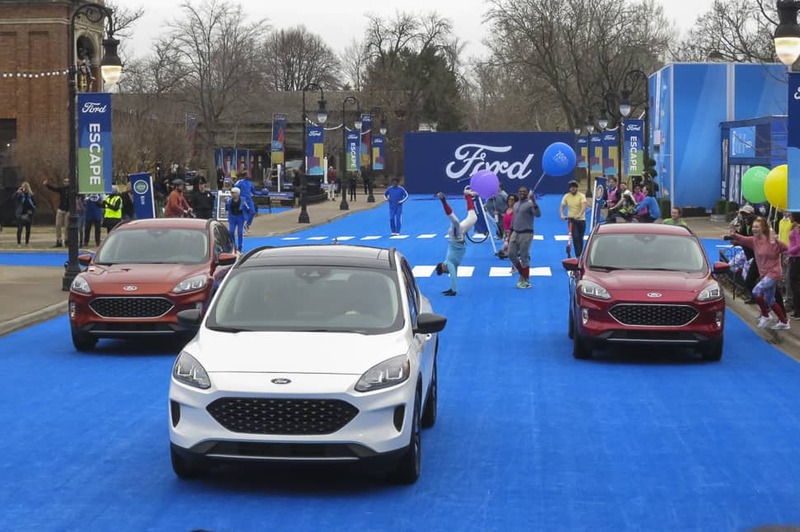 But Ford is touting it as “the best-performing, most fun-to-drive Escape ever.” Based on what we see with the reduced weight, aerodynamics, and improved performance compared to the 2019 model, it’s tough to argue this point. Power improves across the board compared to the outgoing Escape. The 1.5L goes from 179-hp to 180-hp (not much); the 2.0L increases from 245-hp to 250-hp. Meantime, here’s what to expect for power and performance options. Available on the Escape Titanium top-level trim, the new 2.0L EcoBoost will now put down a respectable 250-hp (with premium fuel), and 275 lb.ft of torque, while getting a 10-percent bump in the 0-60 mph sprint. As for towing duties, Ford states the 2020 Escape with the 2.0L is rated to tow 3,500 pounds when properly configured. This engine is all-new and standard on the S, SE, and SEL trims. Aside from the increase in horses to 180 and 177 lb.ft of torque, the 1.5L engine replaces the 4-cylinder setup with an all-new 3-cylinder version. Ditching that extra cylinder creates more efficiencies. By opting for a 3-cylinder setup, Ford still managed to improve power. It’s the magic of the EcoBoost, where even their V8-powered vehicles like the F-150 pickup now get smaller V6s while improving metrics. To help conserve fuel, the 1.5L EcoBoost debuts cylinder deactivation, a Ford first for North America, which senses when one cylinder isn’t needed and shuts it down automatically. The system can activate or deactivate a cylinder in 14 milliseconds to maintain a smooth ride. When properly configured, Ford says the 1.5L-powered variant is rated to tow 2,000 pounds. Compact and small AWD crossover models are becoming top-sellers, especially in markets like Canada, where a majority of the medium-sized Ford Edge, for instance, are leaving dealerships with this option. For 2020, gas engine-powered Escapes as well as the standard hybrid are available with all-wheel drive. Providing quicker shifts and improved dynamics on the road, all EcoBoost-powered Escapes are mated to a new 8-speed automatic transmission. Gone is the 6-speed transmission from 2019. Again, we haven’t driven this yet but are expecting better handling from an all-new suspension and improved isolation with a new isolated rear subframe. Keep an out for our full, unbiased review. This was never introduced in the previous Escape. Now, drivers have quick access to a more fine-tuned drive experience with modes for normal, eco, sport and slippery, plus snow and sand conditions. Splashing driving info, including speed, across a fairly large 6-inch screen on the windshield, Escape Titanium models get an all-new, optional HUD. This feature is a Ford-first in North America. With embedded modems onboard for 4G LTE WiFi, Moms and Dads everywhere will be happy to know passengers (i.e. grumpy kids) can connect up to 10 devices up to 50-feet away, with compatible wireless subscription service. The innovative feature also works with an app and smartphone providing vehicle diagnostics and other remote duties like locking/unlocking and ignition start. New Escape offers an available 575-watt 10-speaker B&O Sound System by Bang & Olufsen. Standard is an 8-inch touch screen on SE models and above, while the new 12.3-inch is an upgrade. The new all-digital instrument cluster is customizable and uses 3D animated graphics to indicate the drive mode. Takeaway: Should you buy a 2020 Ford Escape? With the small utility segment heating up with 20+ players in the field, Ford needed to ramp up its top-seller. From what we can see, less any driving impressions, the new Escape does a good job marking the major boxes. Styling is progressive and looks more sporty, the 4 powertrains options offer enough flexibility and choice, the interior is revamped and much bigger than before, rear cargo got some extra love and space, and Ford jammed this little ute with loads of tech. Again, look out for our full test drive later this year. Learn more at the Escape site here.